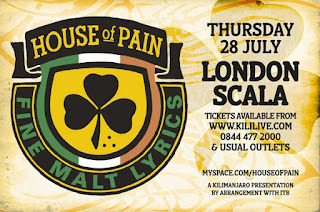 House of Pain, July 28th @ Scala, London. 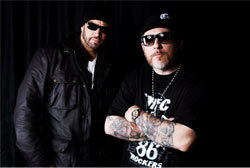 I was fortunate enough to catch two thirds of the Soul Assassins crew - Cypress Hill and Funkdoobiest - live back in the day in London. I am sure I have the ticket stub somewhere safe and could give you the exact date, just not right now. This is huge for me and I can't wait. Dreams do come true. I'll speak for myself, but there was never any question as to their ability, giving them credibility not often as readily afforded from either Coast. Hip Hop was blessed in the early 90's and none more so than with these peckerwoods. Raw, confident, and early interviews have shown they were already planning their future. For all the hype over the Irish horns blaring on Jump Around, this was no fad. The group (and the song) had longevity stamped all over them long before their second LP dropped. When you are as good as they continue to be, it's no fluke, stroke of luck, dance gimmick, clothing line or marketing ploy. It's down to the obvious work they put in, their unwavering passion, their unmistakable Soul. For me, it's simply 'right' and continues to be at the right time too. Especially when you consider just how much easier it'd be to just to live off of ringtone sales or the easily forgettable club hits that make up the majority of acts in a genre currently saturated by 'rappers' with absolutely nothing to say.